Plants grow themselves, compost happens and then inspiration strikes in a garden. I was full of the lazy gardener’s lament this evening, thinking about all the weeding, harvesting, pruning and deadheading I haven't done like I should. Some of it is my fault, some of it isn’t my fault. After all, I can’t harvest tomatoes if they aren’t ripe, can I? But I do blame myself for waiting at least six weeks after it was ‘done’ to harvest the second batch of compost from my compost tumbler. I know I haven’t mulched enough this year, another lament, and so I was thrilled to finally harvest two tubtrugs full of compost this evening, which I promptly spread on some nearby marigolds and zinnias. Those marigolds and zinnias are bravely growing where some ratty ol’ Forsythia used to be, in some poor, tired dirt, so they deserved the compost more than other flowers. They are proof that plants grows themselves, with not much of a helping hand from the gardener, other than I cleared that bed and sowed the seeds. Aren't those nice straight rows? I really do need to concentrate on planting more randomly or at least in curves. The weeds have no problems growing randomly all over the place, all by themselves. They are a little too ‘successful’ this year, and I’ve got some catching up to do to get ‘em before they set seed. Thanks to reader Lisa Blair of A Shower Fresh Garden, I believe my mystery weed is False Daisy, Eclipta prostrata. Bad weed. I pulled more of it with a vengeance this evening, with a renewed sense of who the enemy is. It's False Daisy! It's an annual weed around here, so I don’t want to let it set seed! 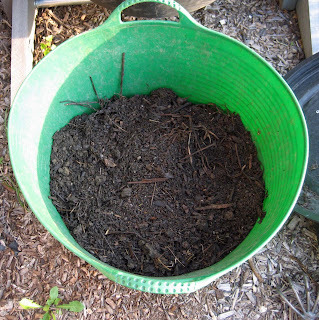 So with all the weeds and the overflowing compost bins, it was easy to fill the tumbler up again with a good mix of brown and green garden waste and then give it a couple of fast spins. I’m marking my calendar hoping to have another batch of compost in early September. But before early September, I will surely harvest a nice ripe tomato, too. A nice one. Not one like this. I declare this to be the World’s Ugliest Tomato. And it is the only one turning red in my garden so far. Can you believe that? I’ve been waiting all this extra time for the first big, ripe tomato, and it looks like it is going to be this ugly one. So in keeping with my goal of winning any tomato contest I have, I’m issuing a challenge to all garden bloggers to show us your ugliest tomato. The only rules are it has to be ripe AND you have to eat it. So don’t show me a bunch of tomatoes with blossom end rot or anything like that. Post a picture of your best, ugliest, edible tomato. Go ahead, but I know mine is the ugliest! And all decisions of the judges are final! You beat everyone to that last sentence :-) Maybe it requires an age restriction because it's too shocking? That is uglier than any tomato I've ever grown. And since I'm not able to grow my own this year, I can't participate, but if you need any help with the judging, let me know. I don't have any ready right now. My tomatoes are in the freezer from my first harvest They were ready to eat in June and early July.. I have my fall tomaotes in now. No, I've never seen an uglier one. If I do, I'll surely post it so I can win. This post is so witty and fun to read. I like that you gave your coneflowers a good dose of composted soil cause they were in ratty soil. Who of us hasn't done that. 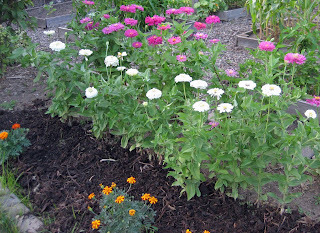 We plant something and mentally remember to go back and be better to it when we have time or compost. Wow, I would like to see parents of that beauty. If it tastes good, just call it Ugly Duckling! I have a pretty scary-looking tomato (third one down here), but it's not ripe yet. I'll keep you apprised. I picked my first three ripe tomatoes the other day, but they weren't ugly. I guess you win this one too, at least in the family. Kathy's right. You win this one. I really like the wrinkled tomatoes, I think they're neat. My grocery store sells them for a lot more than regular tomatoes. I just picked my first ripe tomato on Sunday. That's pretty ugly, Carol. In fact, it's WAY ugly. I might just have a contender though. Can an ugly tomato break a camera? It's ugly, but...I think YouGrowGirl's reply via Twitter provides stiff competition. I don't know, Carol. My 'Pink Caspian' heirloom tomatoe plant is growing some pretty ugly tomatoes. They aren't close to ripe yet (that's what I get for moving at the end of May), but when it is, I'll post about it and send you the link. I have no tomatoes so by definition, yours is uglier than any of mine! I like Sherry's description of it. Perhaps an alien bunny took revenge upon you for spooning his earthly compatriots? I am an expert on ugly and that thing is, indeed, ugly. I may have an uglier one brewing, but I doubt it. It's a purple cherokee and it's beginning to take on the look of Ernest Borgnine. I think its lovely and completely original- you wouldnt find anything like that in the supermarkets, thats the beuty of growing your own. I can't tell you what I think it looks like, as I don't want to offend. It is, as some people might describe it, b--- ugly. but I bet it is delicious. Wish I could find some tomatoes in the compost that were ugly, only acorn squash there. Well they are selling ugly tomatoes for $4.99 a pound at Whole Foods! I'm thinking you can make some money on this one! That is ugly-can't say I have grown an uglier one. You should have an ugliest tomato contest. Sorry you are not having a good tomatoe year. Some years are like that. We ar getting quite a few but plants seem to be struggling. I made salsa today. Wish I could share some with you. 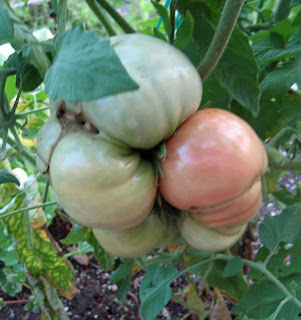 I've posted an update on the World's Ugliest Tomato. It only gets uglier, in my humble opinion!